Regiment/Service: Devonshire Regiment 8th Bn. Panel Reference Panel 35 to 37. Pte. 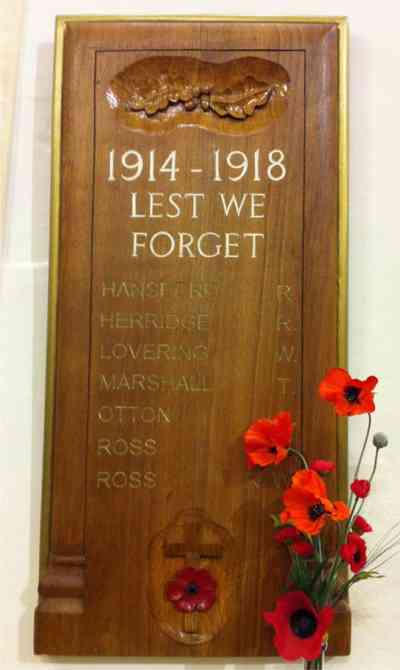 4288, Robert was in the 8th Bn. Devonshire Regiment and mentioned twice in despatches for his bravery in the Second Boer War. He was also entitled to the Queens South Africa Medal with clasps for Belfast, Elandslaagte and the Defence of Ladysmith; Kings South Africa Medal with 2 clasps; 1914-15 Star, British War and Victory Medals. Robert re-enlisted during WWI and died on the 25th September 1915 with the rank of Sergeant, and is remembered with Honour at Loos Memorial. Private Hansford earned his D.C.M. most likely for the Wagon Hill action. During late 1899 and early 1900 the 1st Devon’s were engaged against the Boers in the Siege of Ladysmith, in South Africa. Ladysmith is surrounded by hills and the garrison units were tasked with keeping the Boers from taking the heights to prevent Ladysmith coming in range of their artillery. On the 6th January the Boers made a determined effort to assault Caesar’s Camp and the Devon’s were tasked with preventing its capture. Wagon Point formed part of Caesars Camp and it was successfully cleared by the Devon’s during a vicious thunderstorm. During the action a Lieutenant Masterson won a Victoria Cross. Regiment/Service: Queen's Own (Royal West Kent Regiment) 7th Bn. Son of William and Mary Herridge, of Sidmouth Junction, Ottery St. Mary, Devon, husband of Ivy Blanch Herridge, of 8, Holland Rd, St. Thomas, Exeter, Devon. He is buried behind German lines in an area that was never occupied by the British. The only explanation as to why he is buried where he is, is that he was a prisoner of war who was wounded during his capture and subsequently died of the wounds on the way to captivity – possibly at a German field hospital. Regiment/Service: Devonshire Regiment 4th Bn. Grave Reference XXI. W. 48. Son of Henry and Mary Elizabeth Lovering, of Kercombe, Gittisham, Honiton, Devon. Born at Broadhembury, Devon. 593rd M.T. Coy. attd. VIII Corps Heavy Artillery. Grave Reference III. E. 23. In Feniton on the 1911 census, brother of William and Lillian Marshall born about 1871, farm worker. 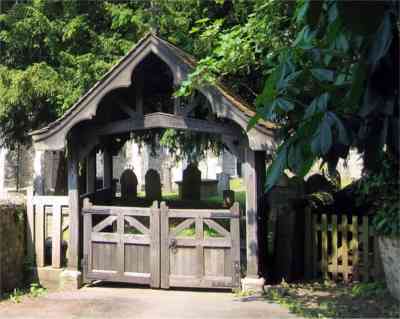 Grave Reference; North-west of the church. Son of Edith Jane Hunt (formerly Otton), of "Laurels," Colestock, Honiton, and the late George Otton. Grave Reference North-west of the church. Son of Hugh Workman Ross of Christow, Sidmouth Junction. 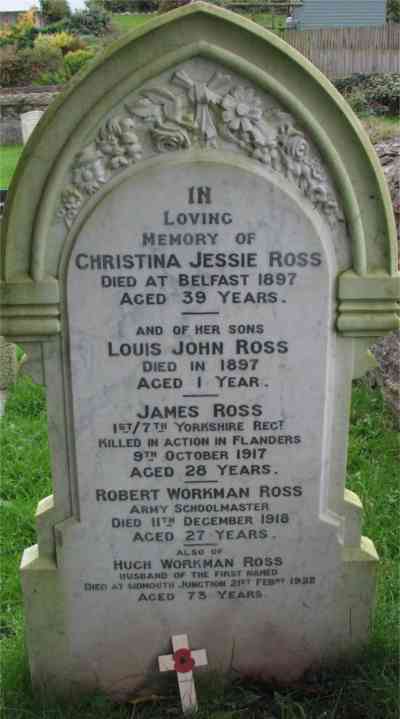 and his wife Christina Jessie Ross; brother of James (see below). Discharged from the army suffering from TB and died at home 11th December 1918 aged 27. 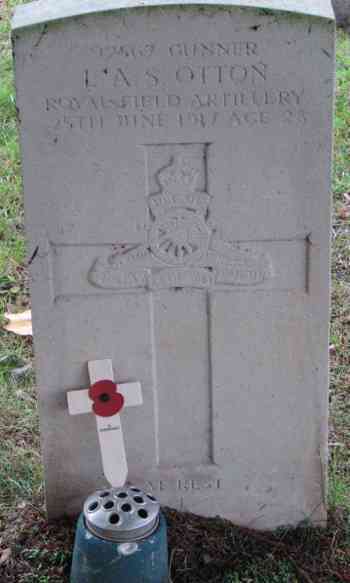 Buried in Feniton churchyard..
Regiment/Service: West Yorkshire Regiment (Prince of Wales's Own) 1st/7th Bn. Panel Reference Panel 42 to 47 and 162. Son of Hugh Ross, of Christow, Sidmouth Junction, Devon. Robert and James were brothers, their father and stepmother came to live at Sidmouth Junction on retirement from the army. James was declared 'missing presumed dead'. Their father Hugh said he would never move again in case 'Jim' came home.